Sony knows just how important music is to people, and for the upcoming holiday season, the consumer electronics giant has prepared not one, two, or three, but five new audio accessories that ought to be able to cater to just about any and every audio demographic, offering versatility, personalization and freedom from wires courtesy of Bluetooth technology incorporated into these devices. 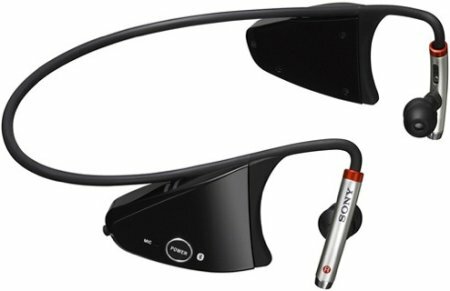 As with most other Sony products, you can be sure that they will not skimp on style either, so you can look forward to fairly fashion forward and functional headsets. More of these in greater detail right after the jump. The wireless DR-BT160AS Bluetooth Active Style Headphones as shown above target those who lead an extremely active lifestyle, staying in place regardless of whether you work out, walk, run or do anything active while listening to music. Apart from dispensing audio, it also has an integrated microphone that allows you to carry out a conversation as well. With its ultra secure fit adjustable earpiece shaft, you can be sure that it will remain in place no matter how vigorous your workout is. The DR-BT160AS headphones will retail for around $130. Travelers who can’t live without their music, there is the new pair of noise canceling headphones known as the Sony MDR-NC7. Just in case this looks and sounds familiar, it is actually an upgraded version of Sony’s most popular model, the MDR-NC6. It comes with an improved style and noise reduction to complement the improved noise canceling technology found within, reducing up to 87.4% of ambient noise when worn. I wouldn’t wear this while jogging though, as I might get run down by a truck without knowing what hit me. Available in black or white colors, the MDR-NC7 will retail for approximately $50. For those who prefer travel speakers that work and look great, there is the new SRS-M50 speakers that are small and lightweight – two main criteria for travel-friendly devices. Perfect for those who want to share their music with others around instead of remaining isolated with your headphones, and they can even be clipped together for convenient portability. The SRS-M50 comes with an integrated battery compartment, a bass reflex and magnetically-shielded 39mm driver unit. You can pick it up in black, pink and white colors for $50. As for the Sony MDR-EX36V EX Style Earbuds, you get colorful metallic accents and an attractive design, featuring three sizes of hybrid silicone earbuds for a more comfortable fit. You can choose from silver, red, blue and pink colors for $30.